Genre scholars are well aware that the idea of an airplane crash survivor being plagued by the supernatural didn’t start with Final Destination. We’ve long cited Thom Eberhardt’s chilling 1982 horror movie Sole Survivor as the picture that set the template for the myriad chillers of its ilk that followed (you can read our passionate essay about that marvelous film here). But actor-turned-director David (Deep Red) Hemmings’ unsettling Australian skin-prickler The Survivor beat that movie to the punch by a year and it, in turn, was based on a well-read novel by British writer James (The Rats) Herbert. The relatively low profile film has now been re-released by Severin in a feature-packed Blu-ray and its an engrossing, disturbing mystery that’s ripe for re-discovery. Hemmings only directed a handful of films in his lifetime, but here he shows an ace eye and ear for the macabre as well as leanings for more fluid, abstract passages that show evidence of his time working for both Michelangelo Antonioni (in 1966’s Blow Up) and Dario Argento (the aforementioned 1975 giallo masterpiece Deep Red). In fact, the film often feels like a lost Italian horror movie, with its languid pacing and meandering narrative and over-the-edge sound design. The latter element is a marvel, with screams and whispers and animal sounds swelling and distorting on the soundtrack while legendary composer Brian May’s intense orchestral/electronic music creeps around the sidelines. And the performances are equally memorable. Powell’s haunted airman is sympathetic and urgent as he tries to overcome his horror at the catastrophe he has oddly emerged from and the madness of the escalating spectral situation that follows. As the pout-lipped psychic, Agutter is fantastic as usual, truly one of the most beautiful women in genre film history (and it was a treat to see her back on screen in films like Captain America: Civil War). It’s also kind of cool to hear Agutter constantly say Powell’s character’s name, “David” as that was her leading man’s name in John Landis’ same year released classic An American Werewolf in London. The two actors have great, intense chemistry and an intelligent presence. It’s also nice to see Hollywood legend (Citizen Kane, Shadow of a Doubt) turned paycheck grabbing exploitation film (Lady Frankenstein, The Hearse) star Joseph Cotten appear as a concerned priest. The Survivor would be Cotten’s final appearance on screen and it’s great that he went out with such dignity. Not all of The Survivor works, however, and often Hemmings and producer Antony I.Ginnane’s (the two worked together previously in Ginnane’s brilliant 1979 vampire movie Thirst) choice to play the film with such restraint undermines some of the story’s more Grand Guignol elements. Perhaps this is why Herbert – whose novels reveled in shock – opted to loudly deride the final film. But taken in its entirety, the movie is genuinely frightening, especially when watched alone, late at night. It’s a smart, stylish and serious-minded piece of atmospheric horror that needs to be seen and discussed. Special features on the disc (some ported over from Severin’s previous DVD release) include extended footage from Mark Hartley’s Not Quite Hollywood doc, a spotlight on the work of James Herbert, Powell discussing Herbert, a vintage TV special about the making of the movie, a great classic TV appearance by the charming and handsome Hemmings discussing his David Bowie/Marlene Dietrich film Just a Gigolo and more. 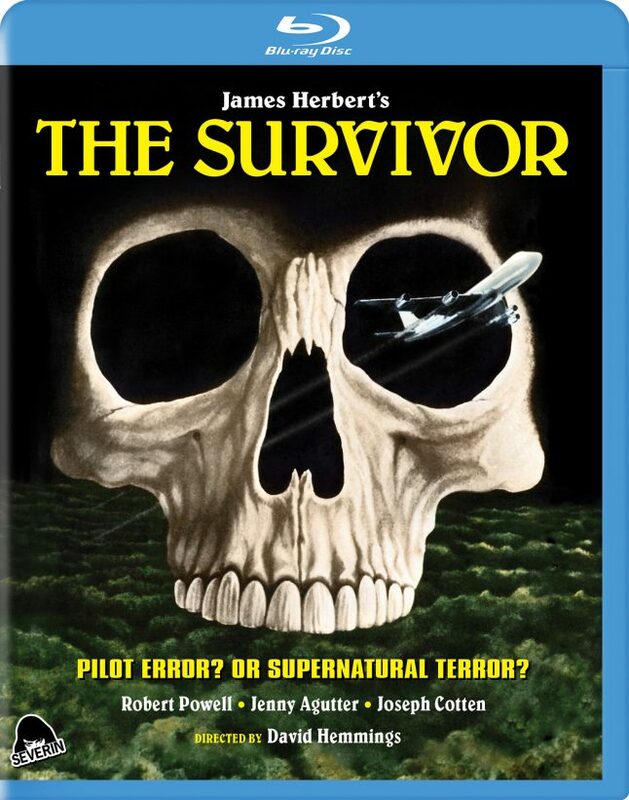 The Survivor comes highly recommended to sophisticated horror fans.